The air is heady and sweet, greeting us as we turn into the driveway, painting our thoughts purple. 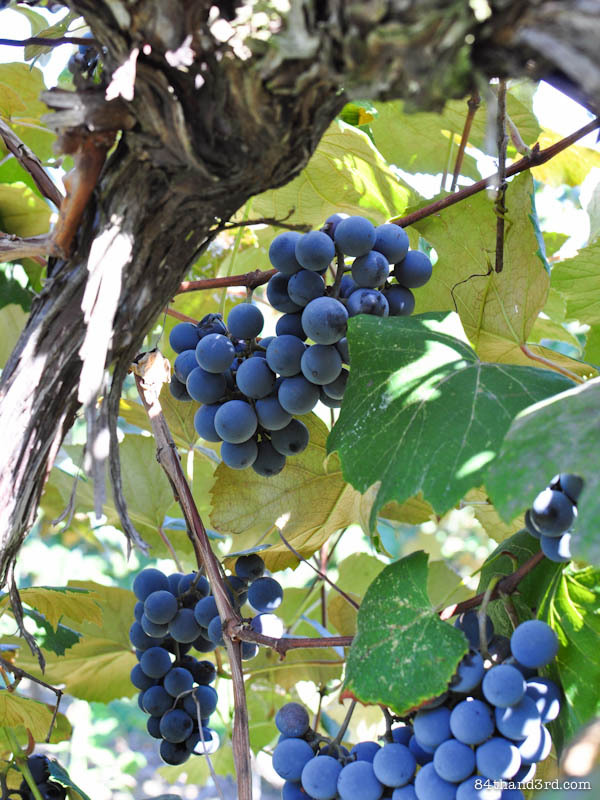 It is the scent of bubblegum and ice blocks and lollies, the scent associated with most grape-flavoured childhood treats, yet not usually with real grapes. 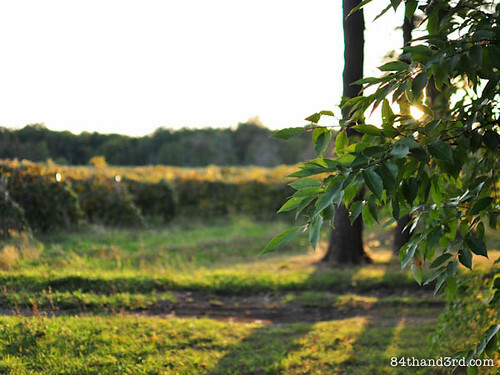 We stand in the middle of the wide green yard, taking in the vineyard’s proud perfume for a moment before we wave absentmindedly back at the farmhouse and head for the leafy rows. 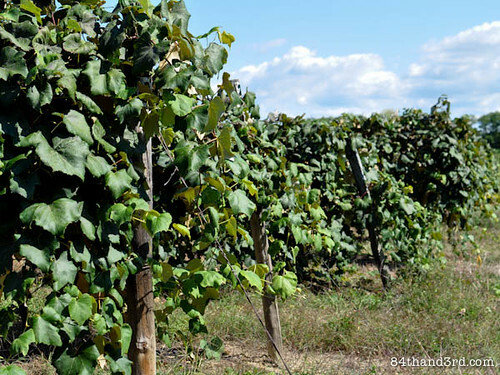 Dodging dogs, skipping over patches of poison ivy and giggling like children — our urgency to reach the vines is obvious — the grapes are waiting. A pop as the skin splits open, sticky juice running down our fingers, soft flesh tasting of pure purple — this is a real grape. This is a Concord. These table grapes are fragile and fragrant. 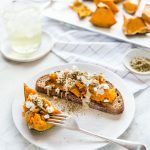 Most commonly used in jams and juices, they appear at farmers’ markets and upmarket grocery stores more often these days — but the season is short and the fruit unforgiving. The ceremony of heading out to the vineyard, secateurs in hand, and returning with a heavy bucket of perfect bunches is a special pleasure. 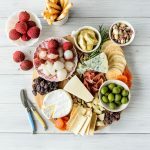 You wouldn’t call us a farming family, yet grapes off the vine have left an indelible mark on our tastebuds, and the farm has left an indelible mark on our souls. 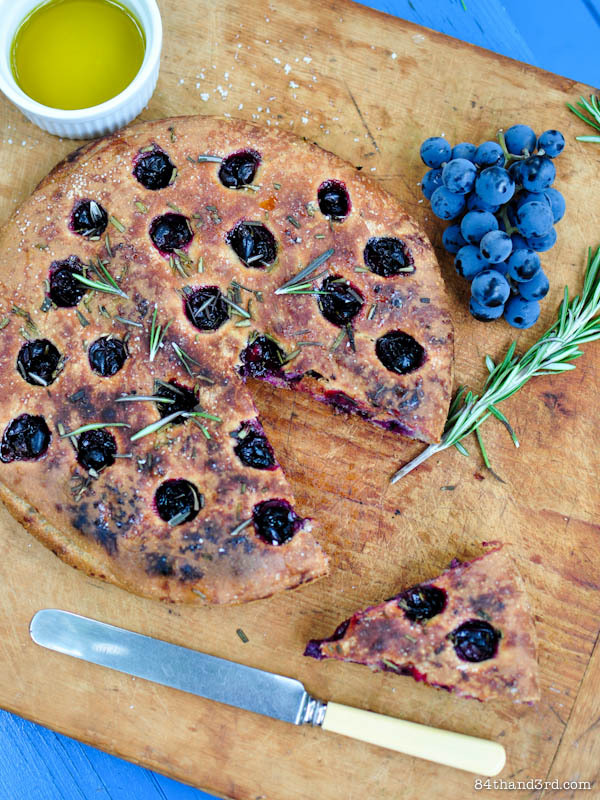 Crisp edges give way to light as a feather focaccia bread spiked with herbal rosemary, sweet grapes and just the right salty bite. You can remove the seeds from the grapes but I prefer to leave them in for a bit of crunch. If you can’t find Concords, use black or deep red grapes instead. Generously adapted from LA Times. Make the sponge the day before. Try to leave it at least 18 – 24 hours, but in a pinch 12 will do just fine. 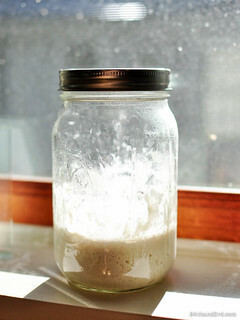 In a large jar or small bowl, sprinkle yeast over water and set aside for a few minutes to dissolve. Add flour and stir well with a wooden spoon or chopstick. Cover top with plastic wrap and secure with a rubber band. Set aside at room temp for 12 to 24 hours, until bubbly and thick. In a large bowl combine water, oil, sponge and rye flour, stirring well with a large wooden spoon. Add yeast, half the whole wheat flour, half the white flour and beat 20 strokes. Add salt and remaining flours and mix well, cutting and stirring for 4 minutes until the dough is stretchy and coming away slightly from the sides of the bowl. Swirl a bit of extra olive oil around another bowl and turn dough into it. Cover with plastic wrap and a tea towel, let rise at room temp until doubled, about 1 1/2 hours. Dust counter lightly with a bit of extra white flour and turn out the dough. Use a floured hand or dough scraper to fold the four sides up and into the centre. Place dough, folded edges down, back into the bowl and re-cover. Let rise at room temp until doubled, about 1 hour. At this point you can fill and top the dough with pretty much anything you want — grapes, rosemary and sea salt are a match made in heaven. Divide olive oil across the bases of two 10 inch cake tins to form a thin layer. Dust counter lightly with extra white flour and carefully turn out dough, taking care to not deflate it. Cut dough into two even pieces and, working with one piece at a time, pull gently into a rectangle approximately 8 inches by 16 inches. Tap 3/4 c grapes into one half of the first rectangle, sprinkle over 1 Tbsp rosemary and a large pinch of sea salt. Fold over other half, press edges to seal and lift into prepared tin. Repeat with other piece of dough. Cover pans with a tea towel and let rest until dough has spread out and risen slightly, approx 30 mins. 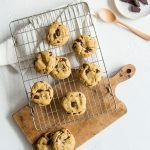 Remove towel and use your fingers to nudge dough toward edges of pan with a few gentle strokes — it is ok if it doesn’t quite reach all the way. Arrange 3/4 c grapes across top of each pan of dough and brush with a bit of extra olive oil. 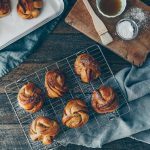 Sprinkle each with 1 Tbps rosemary, a pinch of sea salt and raw sugar if using. Set aside pans to allow dough to rise and puff around grapes, about 30 mins. Meanwhile preheat oven to 220 C (425 F). Bake focaccias in centre of oven for 25 – 30 mins, until crisp around the edges and golden brown. 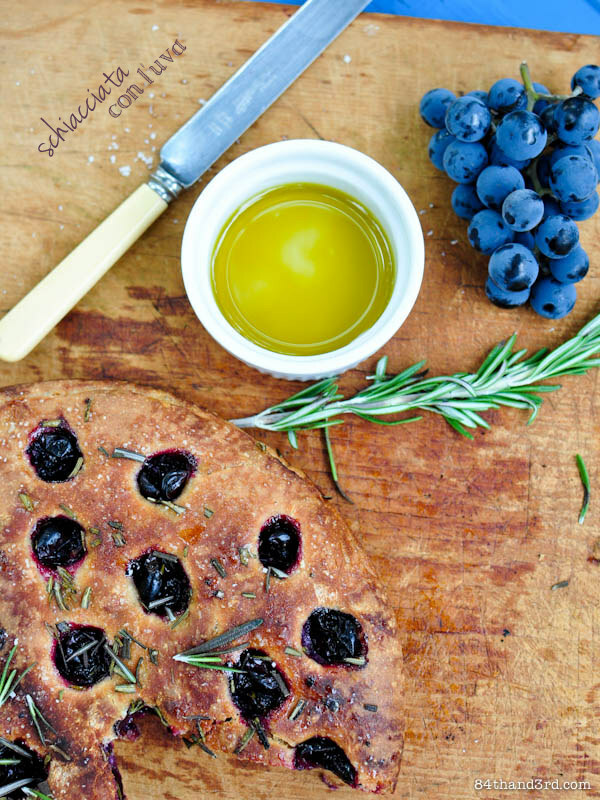 Move focaccia from pans on to a rack and brush with a bit of extra olive oil. Allow to cool if you have the will power, I never do, then cut into wedges to serve. Sounds amazing. Such a shame we can’t get concord grapes here though! 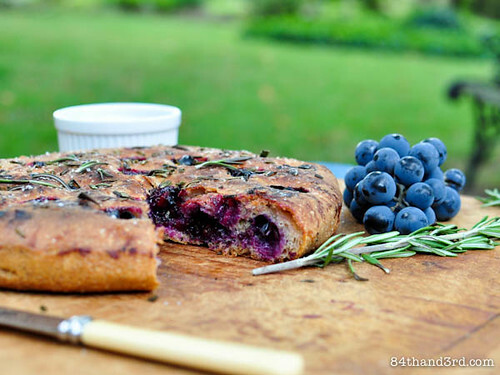 I love Focaccia, this looks so good with the grapes and rosemary! That definitely sounds like a grape I need to try sometime in the not too distant future. Great recipe. Very nice, and the taste is unique beyond words. I absolutely love picking my own fruit. It tastes soo much better than someone else picking it for you. 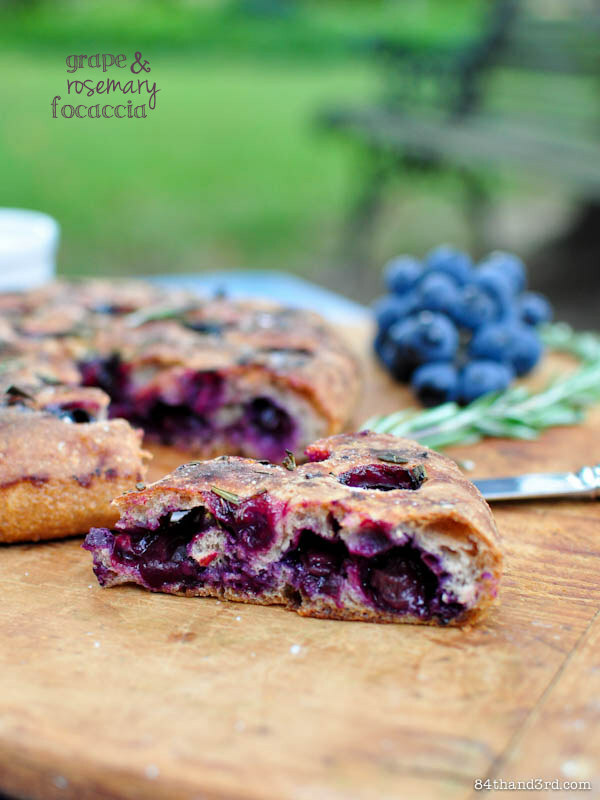 Very interesting focaccia recipe JJ! I know what you mean Claire 🙂 The base recipe would work with pretty much anything in it! I want to cram this directly into my face, without pause. It looks and sounds AMAZING.